The Alaska Railroad . . .
Construction of the famous Alaska Railroad began in 1903, and since completion in 1923 it has linked Alaska's largest city, Anchorage, with Denali National Park and Fairbanks - Alaska's third largest city. It's a spectacular journey across Alaskan wastes, you can do it as an independent traveller or you can find it included with a cruise up to Alaska. There's more detailed & historical information about the Alaska Railroad at en.wikipedia.org/wiki/Alaska_Railroad. Summer = mid-May to mid-September. Winter = mid-Sept to mid-May. Read downwards. Denali Star = Alaska Railroad Adventure & Goldstar classes. Conveys Wilderness Express ultra-dome cars owned by Celebrity Cruises & Royal Caribbean. Aurora Winter train = Alaska Railroad Adventure & Goldstar classes. McKinley Explorer = McKinley Explorer & Princess Rail ultra-dome cars owned by Princess Cruises & Holland America Line. You can easily check dates, train times and times for intermediate stations at www.alaskarailroad.com. Other Alaska Railroad routes: The Alaska Railroad also operates several other routes & trains, including Anchorage to Seward (the Coastal Classic) and Anchorage to Whittier (the Glacier Explorer, and the last flag stop train in the USA, the Hurricane Turn between Talkeetna and Hurricane, serving local communities. All these trains can be found at the Alaska Railroad's official website www.alaskarailroad.com. Seats: Alaska Railroad's Adventure class is the cheapest option, half the price of Goldstar. It offers comfortable reserved reclining seats in classic American railroad single-deck cars, with loads of legroom and big picture windows. All seats face forwards. Open air viewing: The top half of the external doors in the entrance vestibules open inwards and are locked open, you are encouraged to use these for fresh air, scenery viewing and reflection-free photography. There's plenty of room to move around, and it's very relaxed. High school students act as guides, giving an on-board commentary about the sights you pass. Wilderness cafe car: You have free access the Wilderness Cafe car with a serving counter and seats around tables serving snacks, drinks & simple meals, although in Adventure class you pay for what you consume, credit cards only, no cash accepted. Restaurant: Adventure class passengers may use the full-service restaurant on the lower deck of the Goldstar dome car along with the Goldstar passengers. Meals are included in the fare for Goldstar passengers, but must be paid for by Adventure class passengers. Breakfast, lunch & dinner are served in both directions between Anchorage & Fairbanks. Only credit cards are accepted, not cash. You can find sample menus on www.alaskarailroad.com under Travel planning, On board experience, Dining. Vista dome: You have free access to a classic American vista dome, where you climb a short flight of steps to a raised glass dome above the car roof. Seats in the vista dome are unassigned and available to all Adventure class passengers as and when you want. You are asked to stay in the dome for no more than 20 minutes if it gets busy, to let others have a turn. However, you can often stay in the dome for longer as it's not usually crowded, as most travellers reportedly stay put in their own seats. Summary: Adventure class is half the price of Goldstar, but has all the facilities you need: First class legroom, open air viewing, cafe car and classic vista dome. You can even use the restaurant in the Goldstar car if you pay for the food. It's potentially more sociable with more room to move around and meet other passengers than Goldstar. 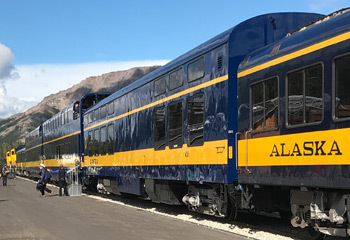 Alaska Railroad's Goldstar class is the top option, with one or two Goldstar ultra-domes operating on each Denali Express or Aurora Winter Train. You are assigned a reserved reclining seat on the upper deck of an ultra-dome car built in 2005-2007, with wrap-around glass sides, ceiling & end walls potentially giving a 360 degree view. If you have been on the Rocky Mountaineer in Canada in Gold Service you'll find these ultra-domes familiar as they are of a similar design and built by the same firm. All seats face forwards and come with a drop-down table, but they can be rotated to form a face-to-face family seating area if you like. A host gives a running commentary on the sights you see along the way. There are toilets on the lower deck. Open air viewing: There is a small open-air viewing platform for fresh air, scenery viewing and reflection-free photography at one end of the upper deck - this can sometimes get crowded for the most scenic parts of the trip, but it is an excellent facility. Meals & drinks are included... There is a small bar on the upper deck and Goldstar fares include 2 complimentary alcoholic drinks for over-21s (sorry 18-20 year olds, this is America!) and unlimited non-alcoholic drinks. Goldstar fares also include meals served in the restaurant on the lower deck. A journey from Anchorage to Denali includes breakfast and lunch, a journey from Anchorage to Fairbanks includes breakfast, lunch and dinner. 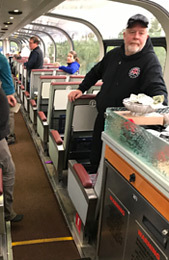 You can find sample menus on www.alaskarailroad.com under Travel planning, On board experience, Dining. The menu prices are for Adventure class passengers who can also use the restaurant but for whom meals are not included. One or two Wilderness Express high-level ultra-dome cars are usually attached to the rear of the Alaska Railroad's Denali Star May-September. These privately-owned cars entered service in 2001-2002, originally just for Royal Caribbean and Celebrity Cruises cruise passengers, but since 2013 they can also be booked by independent travellers. They are of similar design to the Alaska Railroad's Goldstar domes (indeed, built by the same firm, Colorado Railcar) with comfortable reclining seats on the upper level under wrap-around glass sides, ceiling & end walls, with a host giving a commentary on the sights along the way. Toilets and a restaurant are located on the lower deck. 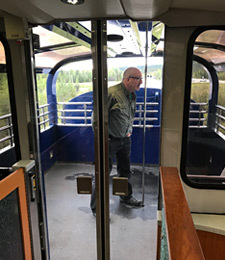 There are two key differences from the Alaska Railroad's own Goldstar ultra-domes: First, the small open air viewing area is at one end of the lower deck, which is great if your car is the last in the train with the viewing platform giving a view back down the track, but perhaps not as good as the Goldstar dome's upper deck viewing platform if your Wilderness dome car is the second from last car - although nothing stops you walking through to the other Wilderness Express car at the rear of the train. Second, meals are not included, dishes are selected form the menu and paid for. You'll be travelling with groups of cruise ship passengers in these cars, rather than with other independent travellers, if that matters to you. The McKinley Explorer is a separate train composed of McKinley Explorer ultra-dome cars. Originally operated solely for Princess Cruises & Holland America Line passengers, independent travellers are now also carried. The ultra-dome cars are of virtually identical design to the Wilderness Express ultra-domes, with seats and bar upstairs, restaurant, toilets and small open-air-viewing platform downstairs. As with Wildness Express, meals and drinks must be paid for. The McKinley Explorer train also conveys Princess Rail ultra-dome cars. These are usually reserved for Princes Cruises passengers, they don't usually carry independent travellers, but it's reported that independent travellers booked on the McKinley Explorer may occasionally be allocated a seat in a Princess Rail car. The Princess Rail cars are identical to the McKinley Explorer ultra-dome cars except that they have bays of four fixed seats arranged face-to-face around tables for four rather than all-forward-facing reclining seats. Anchorage to Fairbanks costs around $244 in Adventure class or $441 in Goldstar class. Or around $265 in the private Wilderness Express high-level dome car. Anchorage to Denali costs around $171 in Adventure class or $314 in Goldstar class. In the private high-level dome cars it costs around $189 for Wilderness Express or $218 for McKinley Explorer. Children under 12 pay a reduced child rate. Infants under 2 travel free if they travel on your lap. For a round trip you pay twice the one-way fare. Fares vary by season, so check actual current prices at www.alaskarailroad.com (ARR cars only) or alaskatrain.com/book (all cars & classes). You can buy tickets for Adventure & Goldstar classes at www.alaskarailroad.com/ride-a-train/buy-tickets. You can buy tickets for the Wilderness Express or McKinley Explorer private high-level dome cars at alaskatrain.com/book. What's the journey from Anchorage to Denali & Fairbanks like? The photos in this section are courtesy of traveller Ed Harsh. If you travel on these trains and get any photos of the food, seating, restaurant or train cars which might help explain the options to other travellers, please email me. The Denali Star boarding at Anchorage station. Starting from the rear of the train (left to right) you can see the two privately-owned Wilderness Express ultra-dome cars, the Adventure class vista-dome car (which also has some Adventure class seating), an Adventure class seats car, and the Adventure class Wilderness Cafe car with it's extra-high roof. The Denali Star stops at Talkeetna for 15 minutes. Note the Goldstar class ultra-dome cars with their small upper level viewing area. 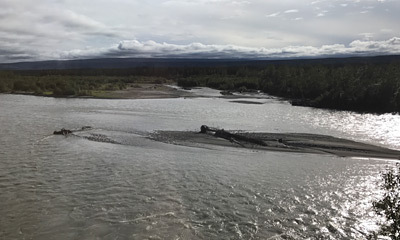 Hurricane Gulch: View from the Denali Star as the train crosses Hurricane Gulch, between Talkeetna & Denali. This is the longest and highest bridge on the entire Alaska Railroad. Indeed, for 8 years after its completion in 1921 this was the highest bridge in the United States. See en.wikipedia.org/wiki/Hurricane_Gulch_Bridge. Denali station... The Denali Star reaches Denali National Park. In this photo you can see (starting with the car closest to the camera) the Adventure class seats car (note its extra-large windows! 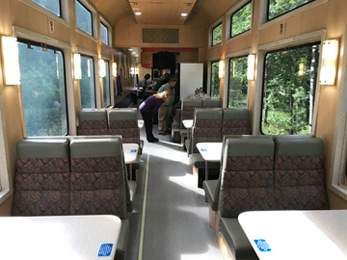 ), the Adventure class Wilderness Cafe car with its extra-height roof and double row of windows, the two Goldstar ultra-dome cars, and (barely visible in the far distance) the baggage car and two locomotives. For Denali Park information see www.nps.gov/dena. 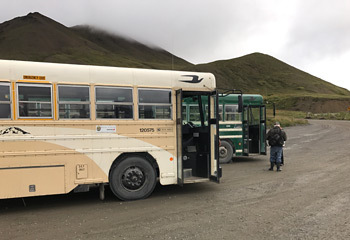 The National Park Service takes passengers from Denali station into the park on converted school buses. 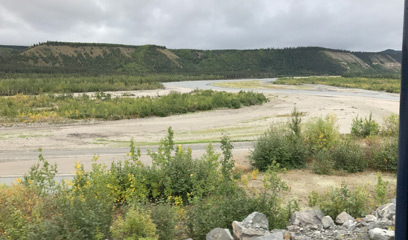 After Denali, the train snakes along the Nenana River. Mount Denali or Mount McKinley: On a clear day it's possible to see Mt Denali (Mt McKinley) from the train, the tallest mountain in North America. But don't count on it - it was not visible on this trip! See en.wikipedia.org/wiki/Denali. 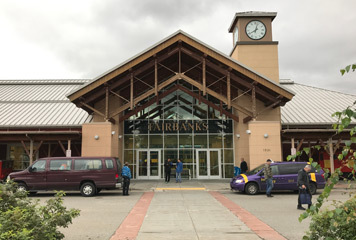 Fairbanks, the northernmost station in the U.S.